Discover how the lowly trashcan will improve your defense, by helping to create throwing lanes. From doubleplays to bunts, fielders have to make plays by throwing around runners. While this isn’t easy, it’s now easier to practice using a simple trashcan. Middle infielders make their doubleplay throws with runners barreling down on them, which is really hard to execute and even tougher to practice. We certainly don’t want our own players running face-first into a doubleplay throw, and yet we’ve got to help our infielders practice these kinds of plays. Catchers and 1stbasemen must also deal with throws involving runners, from either bunts or dropped third strikes, which if we’ve been coaching long enough, we’ve seen go horribly wrong. So, here’s a great way to practice these runner-in-the-way plays, that I recently learned from Larissa Anderson, the head coach at Hofstra. First off, to make a throw, the fielder has to have an open lane for the ball to travel to her target – this is called a throwing lane. The problem with plays that involve runners is the runner is often in that throwing lane. So, fielders have to learn how to move out of that lane to create a new throwing lane that is clear of the runner. And here’s where the trashcans come in (or the bullpen dummies if you have them). 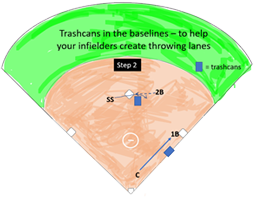 Place a trashcan very near 2nd base while you roll balls to your middle infielders and have them practice making throws to 1st by moving around the trashcan. 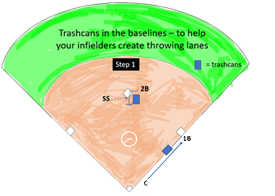 Place another trashcan on or near the 1st baseline and have your Catcher/s and 1st basemen work on creating an open lane for their throw after fielding a bunt or a dropped third strike. Be sure you don’t have your middle infielders throwing toward first with your 1st baseman unless she’s paying attention and ready to catch the ball. If you don’t have 2 nets, then alternate middle infield plays with plays down the 1st base line. Or you can get ALL 68 of our great drills as a member of our VAULT CLASSIC!